Like many other Wellington residents, I took in the Wellington Farmers’Market the other weekend. The importance of public speaking. The market has grown vibrant, over the past five years, from the few rather desolate stalls it started with. Locals like it because it’s a good place to meet and catch up on all the gossip. Besides, it’s fun to look at the tourists. Tourists like it because it’s something to do that’s ‘County authentic.’ Besides, it’s fun gawking at the locals. There is good quality stuff for sale. The criteria for joining the market state “We will seek vendors who create, make, fashion, construct and produce the goods which they sell. Including, but not limited to art, prepared food, crafts, textiles and similar items.” The market is a step up from your average yard sale or flea market. Perhaps, it is now time to imagine how the market might build on its success. In that spirit, I will step forward and note my ancestral soulmates Socrates, Plato and Aristotle hung out, although invention of the skateboard was centuries away, at the local marketplace, which they called the “agora.” Although I must admit I had to look it up, I can advise that the word “agora” derive, from two roots: the phrases “I shop” and “I speak in public.” Yes, in ancient Greece the market was both a place to buy provisions and a place to exchange ideas. A marketplace to exchange ideas. My suggestion is precisely that; we look to the market to become a marketplace for the exchange of ideas. In particular, I think the Wellington Farmers’ Market would be an ideal place for a Speakers’ Corner to be established. That would require you not just to tweet your opinions, but also to orate them. “Speakers’ Corner” is an identified place where anybody can stand and speak about anything that is not seditious or obscene. It is most famously associated with a particular area in London’s Hyde Park, although there are other designated free speech points in the country. 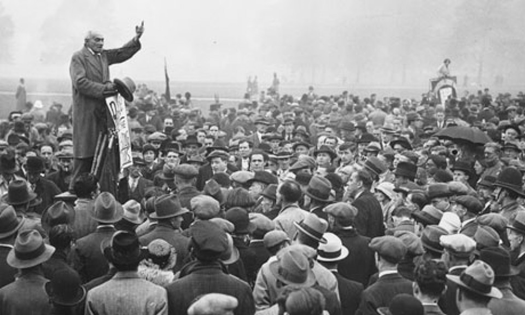 When I visited Hyde Park Speakers’ Corner on a Sunday afternoon, many years ago, there were roughly four different orators in full flight, challenged only by the almost complete lack of interested audience. Speakers’ Corner perhaps achieved the height of its fame during the ‘Ban the Bomb’ rallies against the acquisition of nuclear weapons in the late 1950s and early 1960s, one of the leaders of which was the philosopher Bertrand Russell. Earlier, Marx, Lenin and Orwell were visitors. There have been Speakers’ Corners in Canada before. Regina’s Wascana Park has a Speakers’ Corner monument opened by a Royal, although there is no report of any public speaking going on there these days. In the 1980‘s Ottawa designated a place on the Sparks Street Mall as a Speakers’ Corner, but nobody ever showed up to speak and it was abandoned. A video equipped telephone booth outside a downtown Toronto studio operated for almost 20 years as part of the MuchMusic TV station, but it was not really a forum for the expression of political views. Thus, the title of “Speakers’ Corner (Canada)” is vacant, as far as I can see. The opportunity is there for Wellington to step up to and claim it. It’s not as though the cost would be very high. Renting the space for an average Saturday costs 25 bucks. The only equipment you would need would be a bullhorn and an apple crate, although a little adult supervision would also go a long way. This is Wellington: we can make it work. I can hear you mentally listing all your reservations. Isn’t public oratory dead in the new era of social media? Well, it may be on life support, but everybody appreciates good rhetorical skills. What if no one knows what topics to speak? All we would have to do so solve that one is to leave a copy of the Times onsite: everything from the size of council to what the latest emergency declaration should concern could be grist for the mill. What if there’s reluctance to speak first? Hire some or out of work actors, if that is not a redundant expression. What if what is said bombs? Heckling is just as much a part of the appeal as oratory. What if someone gave a speech and no one came to listen? This is Wellington: we can make it work. So while we recognize success to date, let’s learn the mantra: “I shop; I speak in public” and put it into action. Socrates, Plato and Aristotle would no doubt show up if they could and bring their skateboards.